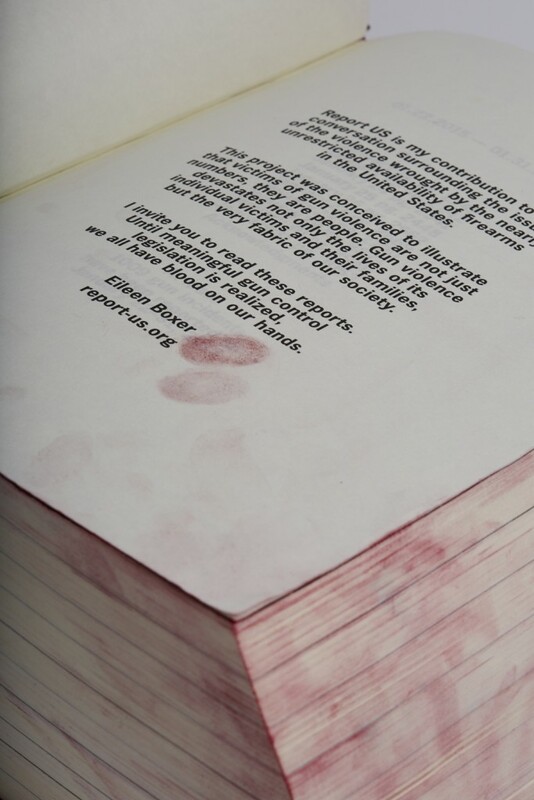 project statement page showing red pigmented fingerprints. page 2704 detail, volume 4. Hand bound and sewn. Asuka digital paper, 48 gsm. 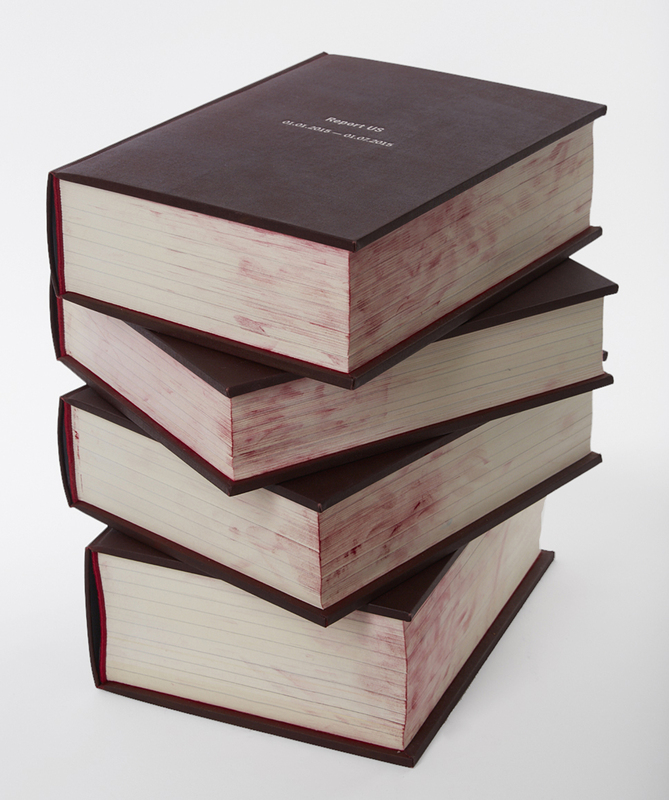 Blood glazed cover cloth, handmade endpapers by Dobbin Mills saturated with unfixed synthetic pigment by Kremer. Hand-tied silk head and tail bands. Report US is my contribution to the conversation surrounding the issue of the violence wrought by the nearly unrestricted availability of firearms in the United States. This project was conceived to illustrate that victims of gun violence are not just numbers, they are people. Gun violence devastates not only the lives of its individual victims and their families, but the very fabric of our society. Since early 2013 I have been committed to this immense project, “Report US.” I have obtained every gun incident collected through the Gun Violence Archive for the entire year of 2015. These profoundly moving stories are like perverse poetry based in irrefutable fact. I have completed the edit of thirty-one days of incidents and compiled into four massive volumes, each representing one week of gun violence, one incident per page. 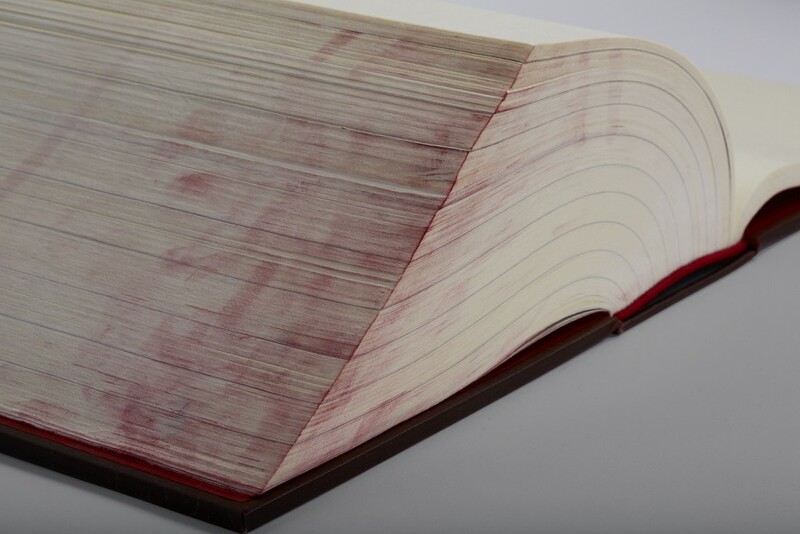 The volumes are hand-bound, in hard-cover and cloth that is glazed with real blood, and end-papers of unfixed red pigment that will “bleed” when touched, leaving fingerprints as the reader lifts each incident page. 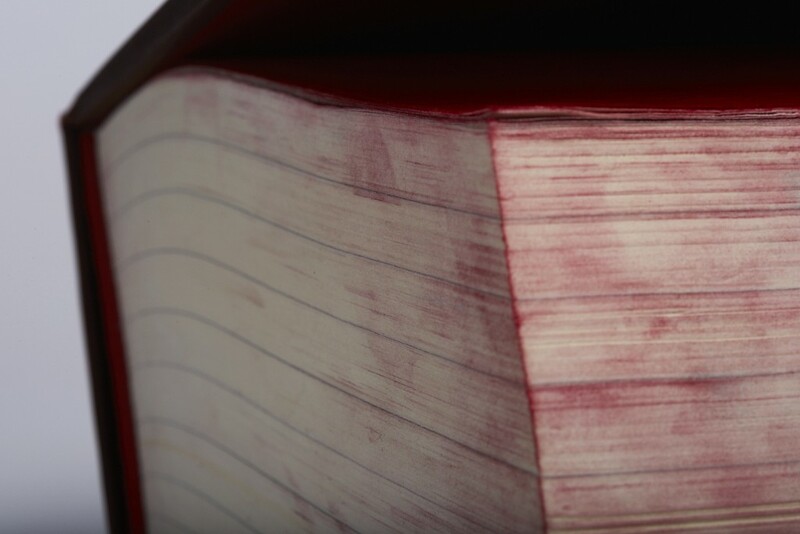 These books, while hauntingly beautiful, are intended to get more and more marred with red smudges and it is my hope they are seen, and touched and read by many thousands of people. 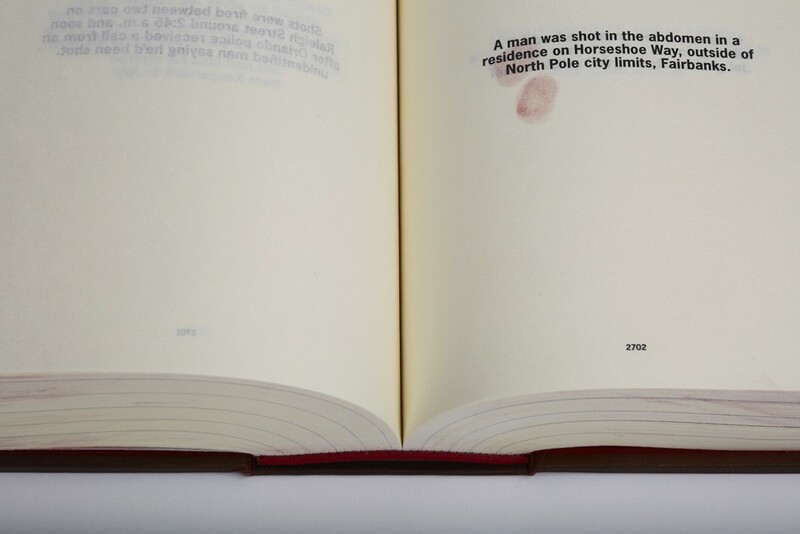 Violence is abhorrent and shocking and through this project I have explored this country’s disease with guns. It is through this project that I now demand that we look at who we have become, inside our hearts, our homes and our societies. This project is more than a series of books, as I have added an ongoing Instagram posts at #reportusdaily where one incident is posted every day. This spring in New York City will see the posting of over 3000 unique stickers, and posters on billboards, each one a gun incident, like small haiku’s of violence. Finally, I would like to realize a public access project where the reports will projected very large on the exterior of urban sites and on digital billboards.